Baku Court of Appeal, chaired by Judge Vidadi Mammadov, held a hearing on the opposition Republican Alternative Movement (REAL) chairman Ilgar Mammadov’s complaint against the Central Election Commission (CEC). Ilgar Mammadov had presented his documents for participation in the repeat parliamentary election to be held in Agdash election constituency #90, and on May 03, 2016, Agdash constituency election commission #90 presented signature sheets to Ilgar Mammadov’s authorized representative. However, on May 05, 2016, Shahin Asadli, Head of Media and Public Relations Department of the Central Election Commission, said that Ilgar Mammadov lost his right to become an MP, because according to the Election Code, a person, in respect of whom a court judgment has come into force, temporarily loses his right to become an MP. Following this statement, Ilgar Mammadov’s authorized representative Natig Jafarli received a phone call from Agdash constituency #90 asking him to return the signature sheets. On May 08, 2016, Natig Jafarli presented the signature sheets to the constituency election commission. Jafarli then filed a lawsuit with the court requesting that the above statement of the Central Election Commission be considered illegal and the restrictions preventing Ilgar Mammadov from moving forward with his candidacy be removed. Ilgar Mammadov’s lawyer Javad Javadov spoke first at the hearing. Javadov noted that such a statement by the CEC representative constituted an interference with the constituency election commission’s work and a violation of Ilgar Mammadov’s voting right. “According to European Human Rights Court’s judgment dated December 09, 2013 in the case of Anchugov and Gladkov v. Russia, the restrictions on the right to be elected to the Parliament established in Article 32 of Russian Constitution, i.e. the applicant’s disenfranchisement on account of his serving a sentence of imprisonment is in breach of Article 3 of Protocol No 1 to the Convention for the Protection of Human Rights and Fundamental Freedoms. By making a statement on an issue concerning the constituency election commission, the CEC representative influenced the constituency election commission. 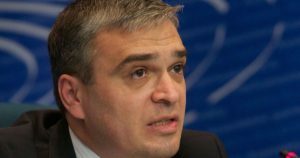 People did not give a signature of support to Ilgar Mammadov after this statement, saying that he was no longer a candidate,” Javad Javadov said. CEC member Ramiz Ibrahimov thinks that CEC representative Shahin Asadli just pointed out the legal provisions, according to which Ilgar Mammadov lost his voting rights, for the media. “According to Article 85.2 of Azerbaijani Constitution, persons having double citizenship, those having obligations to other states, those working in the bodies of executive or judicial power, persons involved in other payable activity except scientific, pedagogical and creative activity, religious men, persons whose incapacity has been confirmed by law court, those condemned for grave crime, serving a sentence due to verdict of law court may not be elected the deputies of Milli Majlis of the Azerbaijan Republic. Furthermore, according to Article 13.3.1 of the Election Code, persons serving their sentence in institutions of confinement by a court verdict, which has entered into force, shall not have a right to be elected as a deputy of Milli Majlis, as President or as member of a municipality. Shahin Asadli gave an interview to the media regarding legal issues and it did not violate Ilgar Mammadov’s electoral rights, because a judgment came into force against Ilgar Mammadov by Shaki Appeal Court’s decision of April 29, 2016, and even he presented his signature sheets, his candidacy would not be registered,” the CEC member said. The court ruled that the lawsuit was inadmissible.